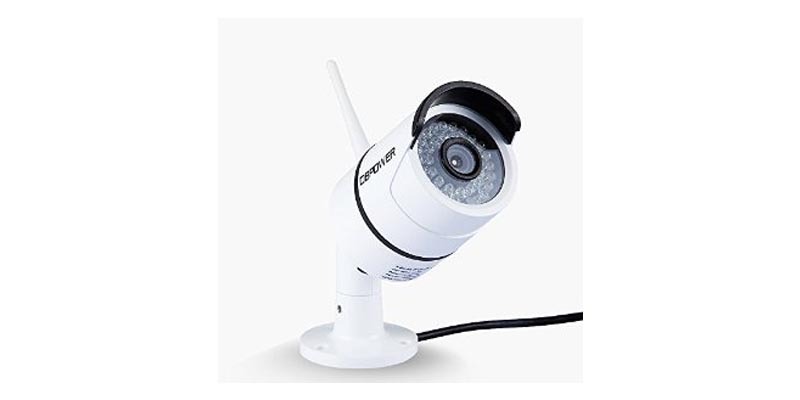 DBPower Waterproof Surveillance IP Camera with Night Vision – this security camera features remote viewing via your smartphone or tablet/PC with a 2 megapixel 1920x1080P display. The camera is also waterproof to IP^^ standards so is suitable for outdoor use. It is infra-red night vision enabled using 36 infra-red LED’s for a night vision range of up to 25 meters, plus there is motion detection with real time alarm push to your smartphone. The system is quick and easy to set up and can be operational in minutes. The 1080P HD Video provides a realistic full colour visual presentation and the DBPower Surveillance Camera uses H.264 compression for smoother video and smaller file sizes when recording. Maisi Indoor Wireless Surveillance Network IP Camera – this enhanced network Wi-Fi camera features high quality HD 1280×720 megapixel resolution video with two way talk using a built-in mic & speaker. This camera is an ideal second set of eyes for your home or office and comes with everything you need to set it up within minutes. The camera has advanced features such as QR code scan & connect, iOS & Android Apps with motion detection, enhanced 3Db antenna, and remote pan and tilt live video control. You can automatically receive alerts to your smartphone when movement is detected and the camera can even see in the dark thanks to infra-red night vision with 12 LED’s. Video and audio along with alarms are transmitted via the Wireless IEEE802.11b/g/n and up to 32Gb of video footage can be stored using a Micro SD card. This is a true Plug & Play system that can connect via smartphone by simply scanning the QR code on the camera. AGPtek KeeKoon Indoor CCTV Security Wifi Camera with Night Vision – this wireless security camera supports both Android and iOS smartphones, along with Windows OS for PC’s and laptops. This AGPtek surveillance camera features a true colour display with motion detection and email alarm. An instant email notification can be sent to your mobile phone when motion is detected and live video footage can be viewed remotely anywhere at any time! The set-up is an easy Plug & Play system with no need for DDNS or port-forwarding. Two Way Audio is also available via the built-in speaker and microphone too, so not only can you see the what is happening, also you can hear and speak!